60-meter hurdles: The indoor sprint hurdles event includes just five, evenly-spaced hurdles. As in all standard hurdles events, runners are not penalized for touching or knocking a hurdle down, as long as they don’t do it deliberately. The start is important in this short race, but superior hurdle clearance technique can help a runner come from behind. Read more about starting block technique. 100/110-meter hurdles: The outdoor sprint hurdle events offer one of the last bastions of gender difference in senior track and field, as the women’s sprint hurdles event is 100 meters long while the men run 110 meters. Both events feature 10 evenly-spaced hurdles. The hurdles in the shorter races are taller than the hurdles used in 400-meter races. For example, men’s hurdles are 1.067 meters tall (3 feet, 6 inches) in the 110 race, 91.4 centimeters (3 feet) in the 400-meter event. As with all standard hurdles races, runners begin in starting blocks and remain in their lanes throughout the race. Read more about sprint hurdles technique. 400-meter hurdles: Both genders run a full lap in the low hurdles event, which also includes 10 evenly-spaced barriers. With 35 meters from one hurdle to the next, competitors may use different stride patterns between the hurdles, to suit their particular style. Some hurdlers always clear the barriers using the same lead leg, but those who can alternate legs have an advantage, because they can better fine-tune their stride pattern. Ideally, all hurdlers stride over, rather than jump, the barriers, spending as little time in the air as possible. The 400 hurdles, like the straight 400, features a staggered start to compensate for the track’s curve. Steeplechase: Not a pure hurdles event, the steeplechase combines distance running and a different form of hurdling. For example, steeplechasers can’t glide over their hurdles, which stand 914 millimeters (3 feet) high for men, but more importantly can’t be knocked over because they’re thicker and heavier than standard hurdles and fill the entire track, rather than just one lane. Some runners jump over the hurdle, while others step on top of the barrier on the way over. The 3000-meter race features no barriers on the first lap. Each of seven subsequent laps includes five hurdle jumps, one of which is followed immediately by a water pit that slopes upwards. The better jumpers are rewarded by leaping into shallower water. The race begins on a curved starting line. Runners do not remain in lanes. Read an interview with Olympic steeplechase bronze medalist Brian Diemer. 4 x 100 meters: Relay teams consist of four runners who must exchange a baton within 20-meter-long passing zones. Exchanges during the 4 x 100 race are just as important as the speed of the runners; races can literally be won or lost via fast or sloppy exchanges. The baton is passed blindly with runners maintaining as much speed as possible during each exchange. The first runner begins in starting blocks, carrying the baton. The second runner stands within a 10-meter acceleration zone that precedes the passing area. As the first runner approaches, the second begins running, enters the passing zone, then reaches one hand back while keeping his focus ahead. The first runner slaps the baton into the second runner’s outstretched hand. The exchange process is repeated two more times. Teams are disqualified if a pass occurs outside the 20-meter zone. The starting positions are staggered and teams remain in the same lane throughout the race. Read more about 4 x 100 relay strategies. 4 x 400 meters: The key difference in the longer race is that teams don’t risk blind passes. The receiver looks back at the passer as they make a safe exchange. The 4 x 400 is more dependent on the ability of four runners to run strong 400-meter times. The start is staggered. The lead runner begins in starting blocks and remains in the same lane for the full lap. The second runner remains in the team’s lane around the first curve, then may leave the lane. Approximately midway through the lap, officials line up the third runners based on the team’s standing – the leading team’s runner is on the inside of the passing zone, the second place team’s runner is next, and so on. The anchor leg runners are lined up the same way. Decathlon: The multi-event disciplines are designed to provide the greatest test of overall athletic skill combined with endurance. In each case, competitors receive points in each event based on a standardized scale. 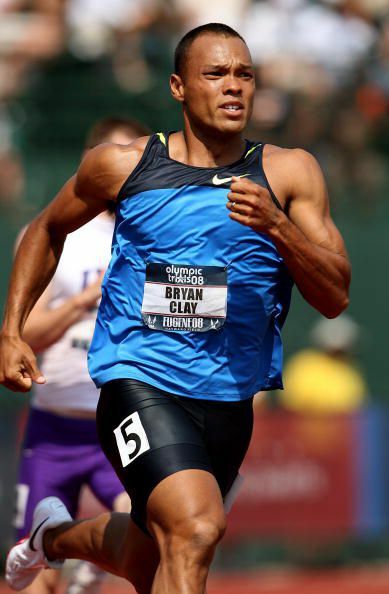 For example, at the 2011 World Championships, Trey Hardee ran the 100 meters in 10.55 seconds and received 963 points, while Ashton Eaton received 985 points by running the 100 in 10.46 seconds. The two-day competition includes the 100-meter run, long jump, shot put, high jump and 400-meter jump on the first day, then the 110-meter hurdles, discus throw, pole vault, javelin and 1500-meter run on day two. The athlete with the most points after 10 events wins the competition. The decathlon is almost exclusively a male outdoor event. Read more about Olympic decathlon rules. Heptathlon: The seven-event heptathlon is the standard women’s outdoor multi-event competition. It’s scored via a standardized points scale, just like the decathlon. The first day’s events include the 100-meter hurdles, high jump, shot put and 200-meter run, followed by the long jump, javelin throw and 800-meter run on the second day. Men compete in an indoor heptathlon at events such as the World Indoor Championships. The individual events include the 60-meter run, long jump, shot put and high jump on the first day, plus the 60-meter hurdles, pole vault and 1000-meter run on day two. Pentathlon: The indoor version is the women’s multi-event competition at the World Indoor Championships, but is held in just one day. Competitors begin with the 60-meter hurdles, followed by the high jump, shot put, long jump and 800-meter run. What Are the Most Common Events at a Track and Field Meet?